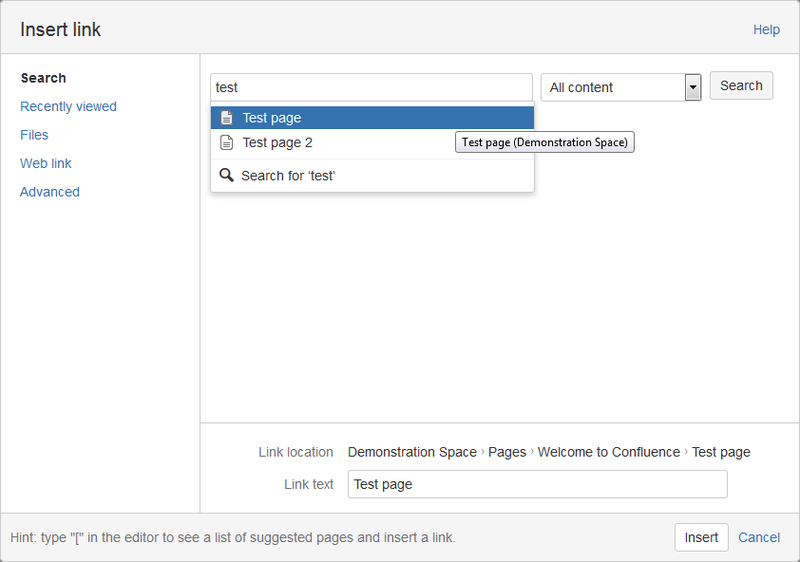 Working with pages in Confluence is the base action. You need to know what you can do in the system. 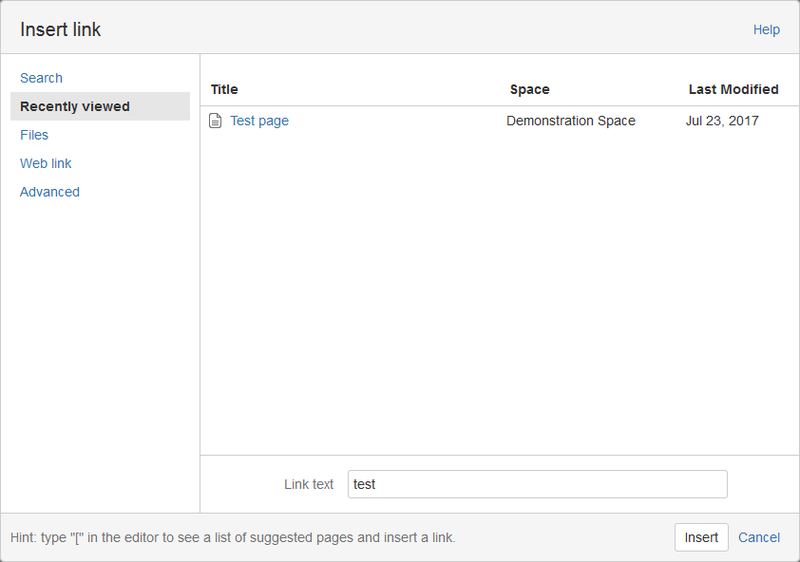 In the previous articles we talked about standard options and page layout settings of the page. This article is fully dedicated to the advanced content options that are available under the postion Insert more content in the main top menu. Some of the options are simple options and some of them are dedicated macros that were added to the menu because they are were usefull in daily activities. Let’s take a closer look at each of the available options in Insert more content menu. In the internet we cannot live without files and images. 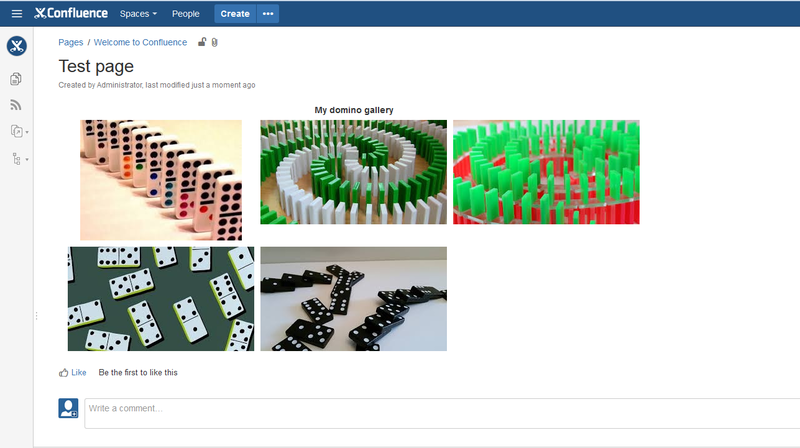 This is basic type of content that in Confluence we can add using the option from the menu or by simply drag and drop set of images from your local file systems. When we select Fiels and images option we can do some more actions. 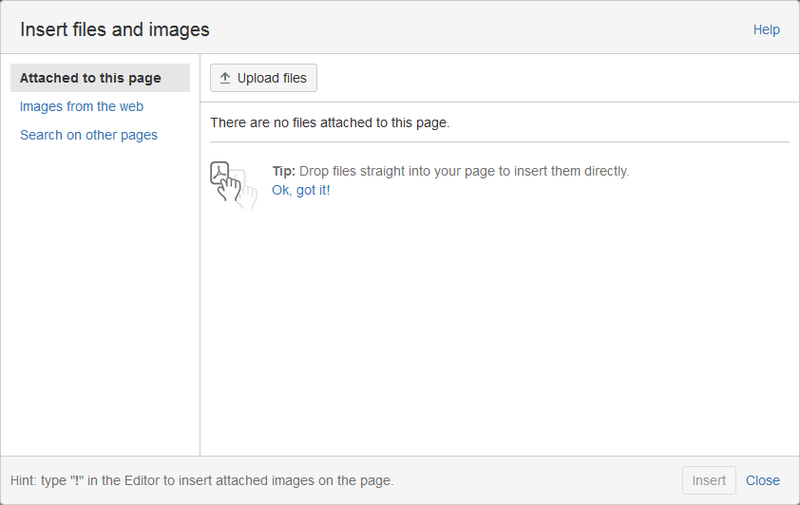 We can simply upload files using Attached to this page option in the left menu. 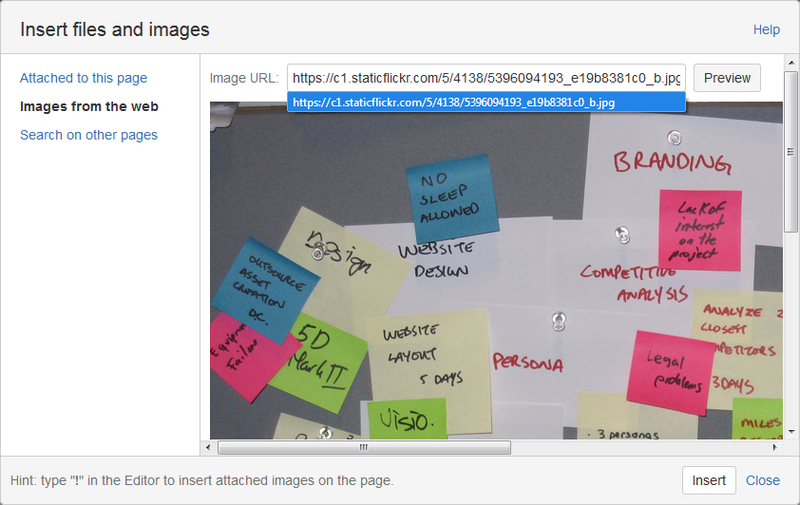 We can also type a link from the Internet to any image and the example we can see below. When you type the correct url address to the image you can immediately see the image using button Preview. You don’t even need to add the image to check if everything is going well. 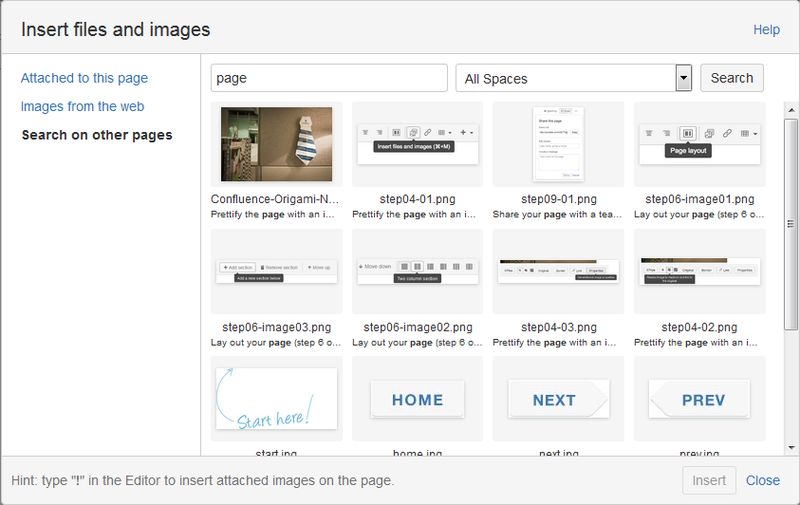 The last way we can add image is by searching images previously added into the Confluence. We can search through all spaces that we have access enabled. When we are ready and we selected any image or set of images we can insert them using button Insert. 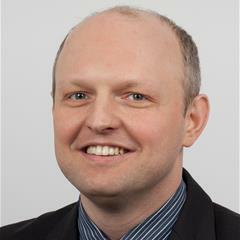 We could not benefit from the knowledge base if we were not able to link between pages. Link option gives us some set of possible linking types. What we can do here is simple search through existing pages. When we start typing the system prompts us possible pages we are looking for. In design mode we can easily go back to the edition of the link, go to the linked page or remove the link using Unlink option. As we can expect in Recently viewed section we are able to see lastly viewed acticles. This is especially helpfull if we use very often some part of pages in our knowledge base. 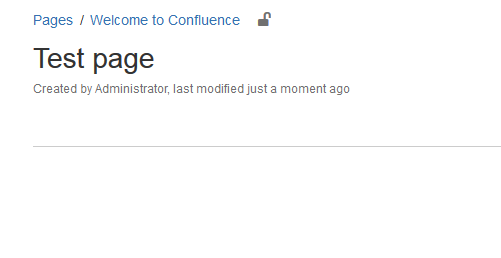 Confluence allows us to link to files. 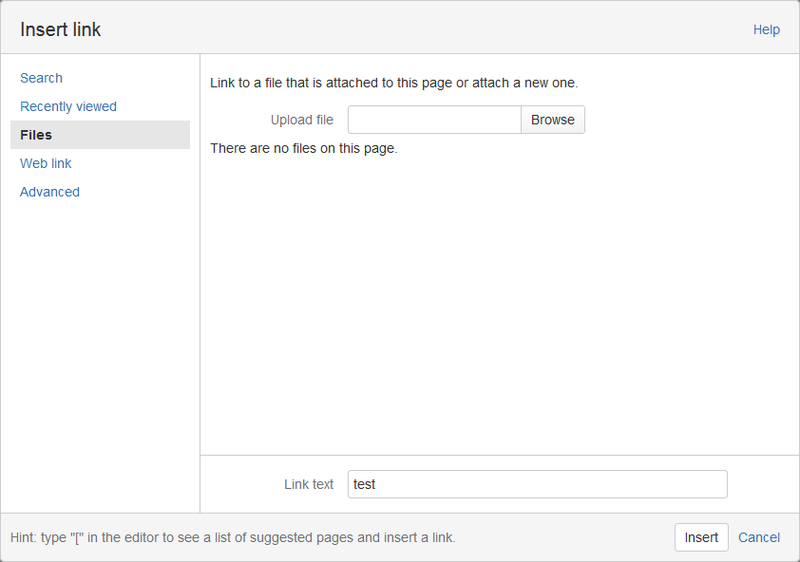 We can quickly upload files and it will be linked on current the page. Sometimes we need to use external resources from the Internet to link to them. 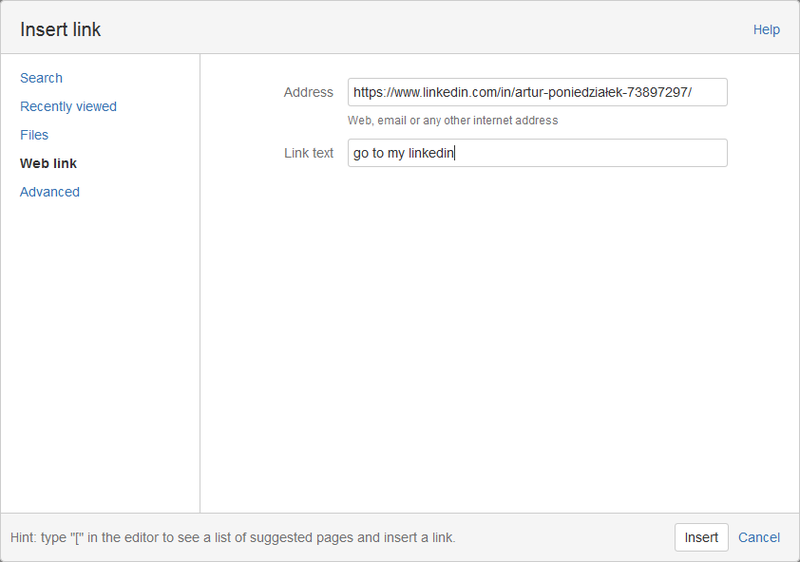 This Web link option gives us a quick access to this way of linking. Type url address and anchor text for the link and that is everything you need to do. This is very tricky option. When we are in the proccess of writing a page we sometimes need to link to the page that does not exist. We also want to create such a page without opening extra new tabs in web browser. 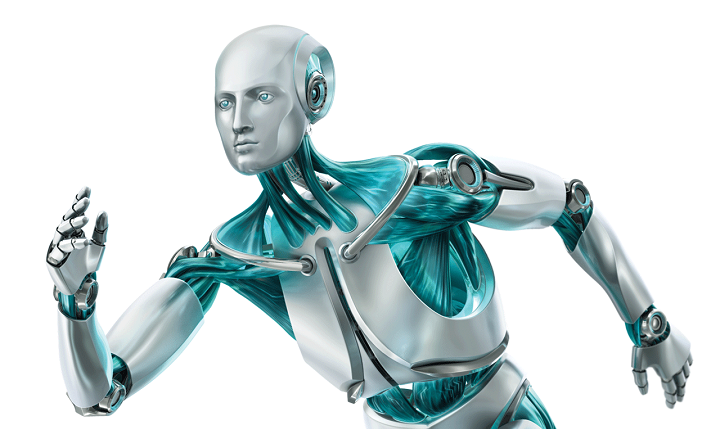 Advanced option allows us to type a name of non-existing page, link text and when you type Insert button you will reach a link to the new page. We can check that link provides us to the newly create page. This page was as default created in hierarchy under the page we added the link to. 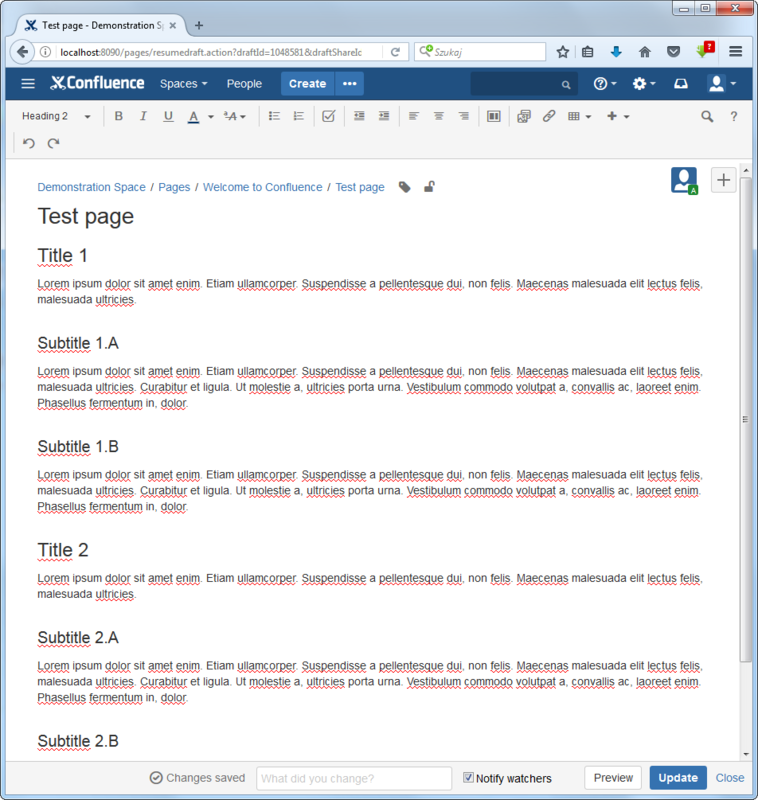 Confluence supports us with many defined symbols that are available under the Symbol position in the menu Insert more content. 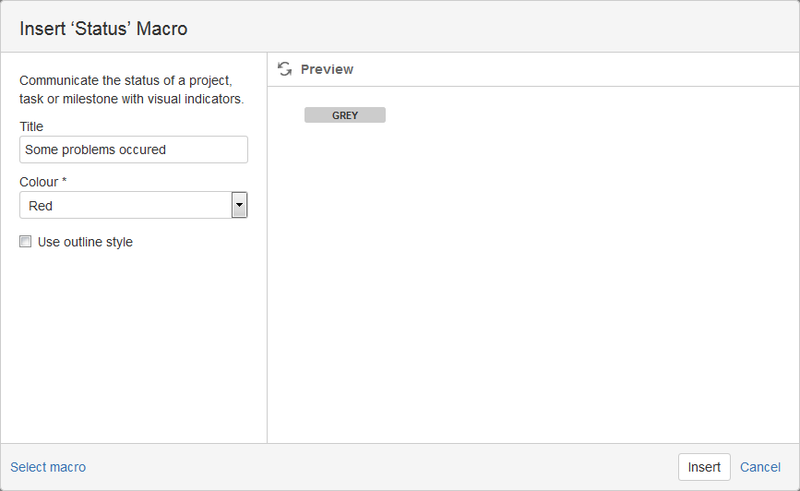 Selecting symbol is very easy we need to click on the symbol and system will add it to the page. 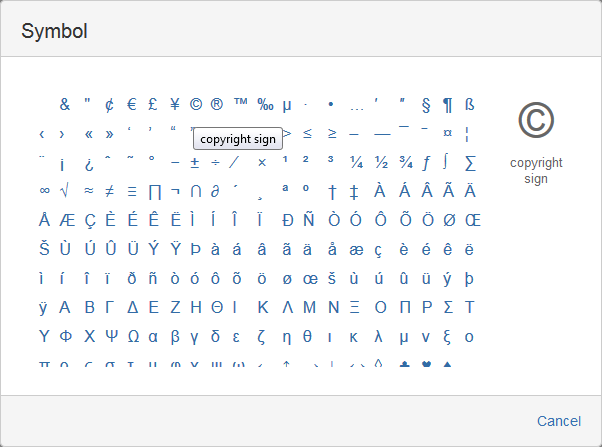 Here as an example we have added copyright sign symbol. There are sometimes moments when we want to highlight some information on the page in a graphical ways. In order to achieve this effect we can use emoticons like: smiling faces or stars. And here we have an example emoticon used on the page. 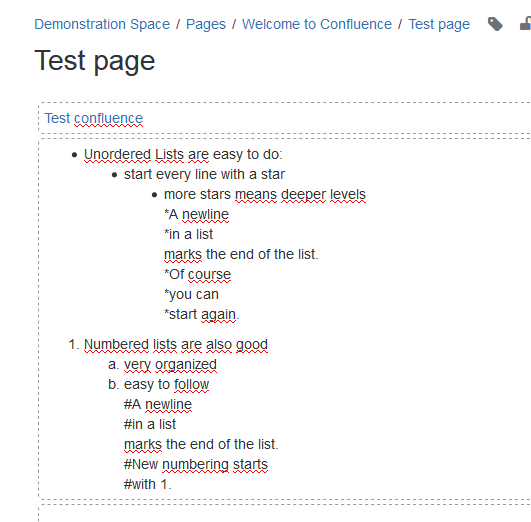 Some more advanced and experienced users probably remember days when there were no knowledge systems like Confluence but was a Wikipedia. 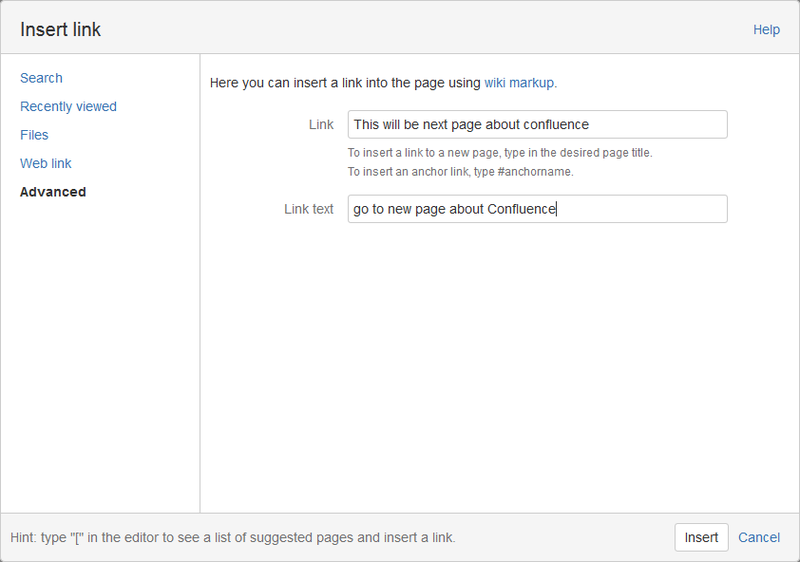 For such people Confluence team created a possibility to play with content using wiki markups. When we select option Markups in the Insert markup window we will see two section: Insert and Preview. 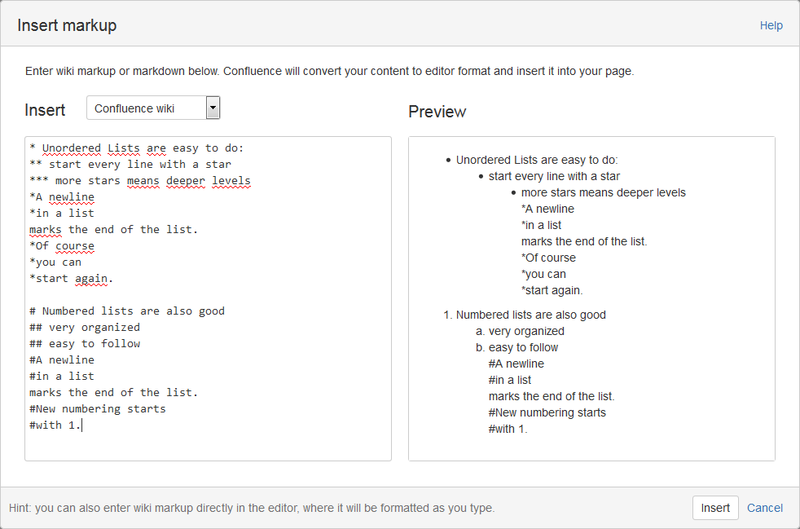 In the Insert section we can type any wiki markups. The result is available in Preview section on the right hand side of the window. Horizontal rule options is used to separate two parts of text horizontally. We can see that as a result system added a horizontal line cross a whole page section. And the same horizontal line but in the read page mode. Task lists are usefull when we organize many meetings and we want to save any actions or decisions in a clear way. This options allows us to make such a lists and gives us a possibility to check/uncheck what has been done. User mention option can be used when we want to save information that some parts of the text on the page is correlated with a concrete user. 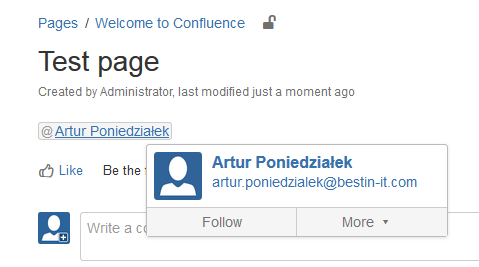 Confluence allows us to search user using User suggestions box. When option is added on the page we can click on such a link and system will display us information about a user. We can also follow the user or see last action the user did. When you use Confluence and Jira in your ogranization you might want from time to time to make a mix of this systems. 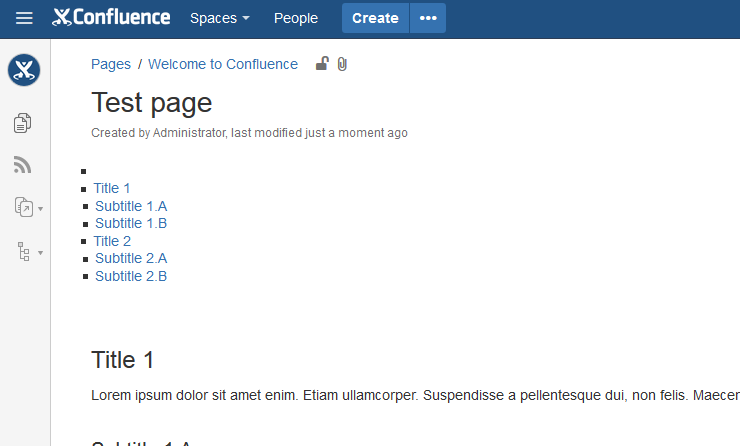 For example you might want to display some part of issues from Jira in page Confluence. 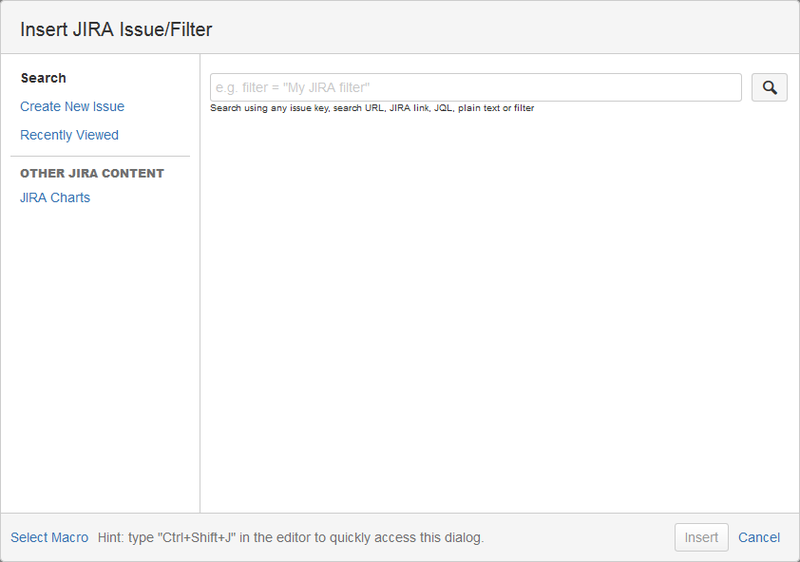 This is possible to do using Jira Issue/Filter option. Using this option is possible when you have made a connection between the two systems. 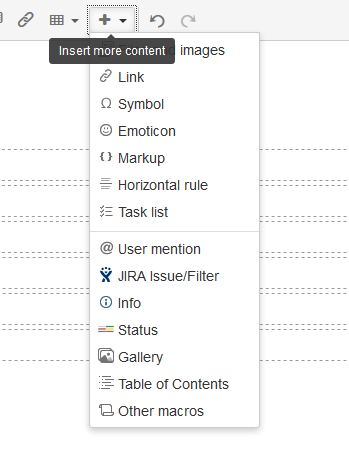 In Insert JIRA Issue/Filter window you can precisely decide what issues you want to display on the page. 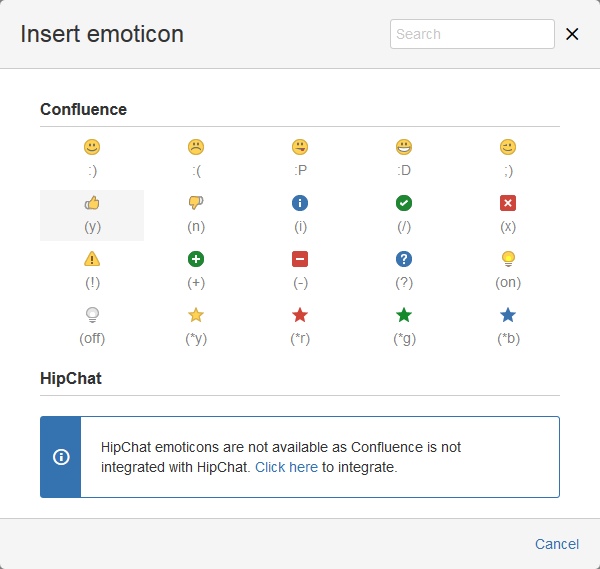 You can also create any issue or just display any Jira charts. The result may looks like below. We can see that there is no any issue in selected criteria but more imortant is fact the issue content is higlight with vertical line and letter A. 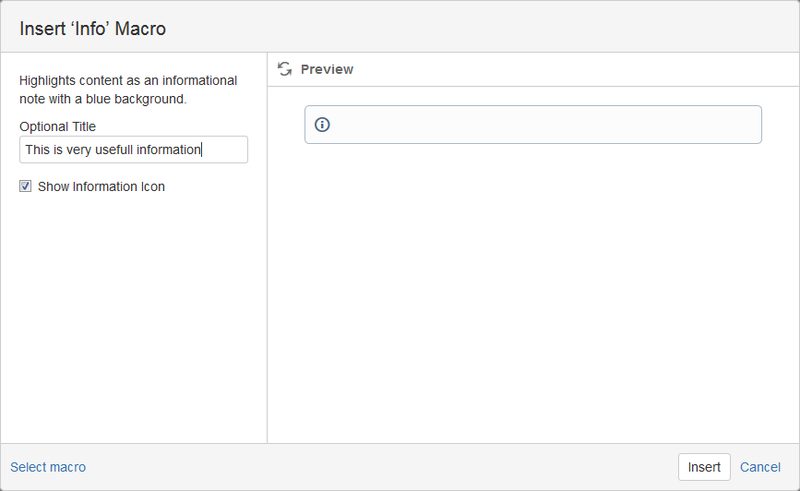 This allows us to easily identify where is a content from Jira system. Info is very simple macro that enable us new presentation form of really important content on the page. Everything we need to do is to type the title click in the Insert button. 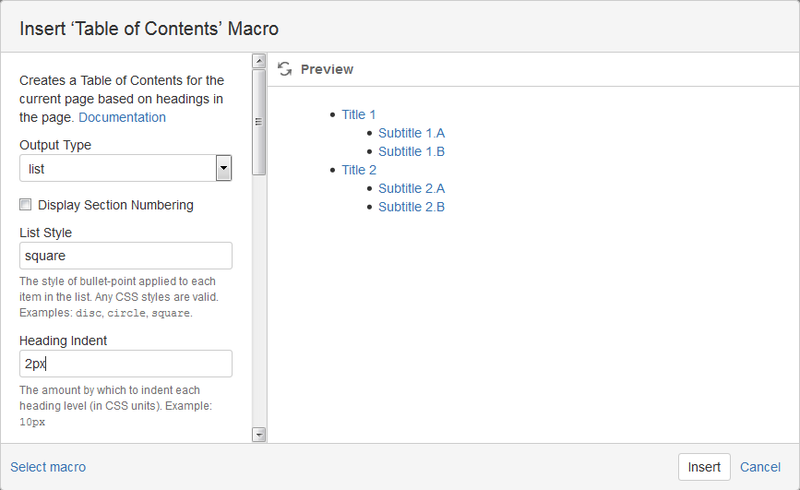 When Info macro is added to the page we can type any text in the internal area of the macro. This option is very often used at the end of the pages as a kind of summary note. Another usefull macro is Status. This option enables us a set of colorful buttons that we can personalize. For every button we can selected its color and type a text that will be displayed in it. Below you can see some sample buttons. 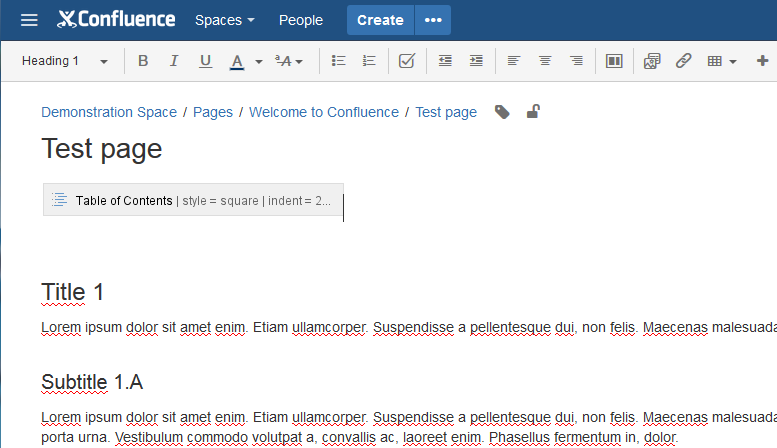 Confluence gives us quick access to change a color of any button or to go to the full edit option window. The Internet will not expand so fast without images content. When we use images we sometime want to put them all in one ordered set making a gallery. When you create pages with rich content divided into headers and subheader it is a moment to think about how to display short information about the content structure. In such situations we can use Table of Contents option. Let’s have a look at a sample page like below. This page has main title, some sort of subtitle and subheaders. 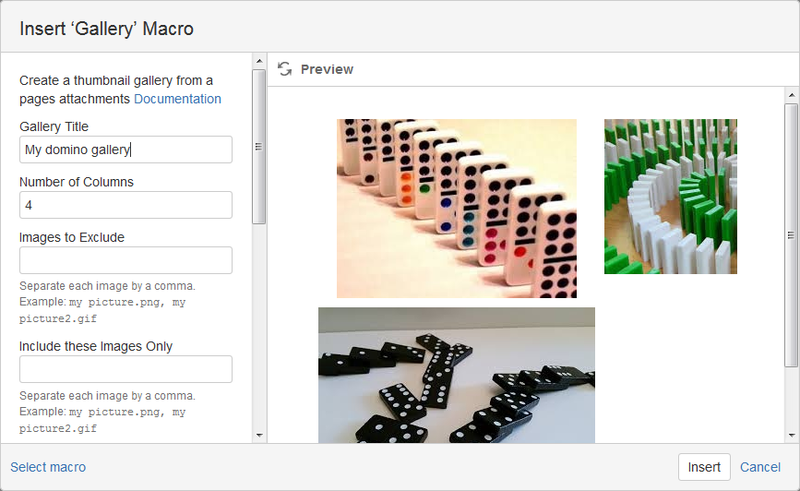 Other usefull marcos available in Confluence will be presentend in the next article.